I’m trying to obtain some information/evidence that could prove that God created an adult man (Adam) from dust. I’m also trying to get information on answering the sceptics. They ask how could God create living Adam out of non-living dust? It is not possible they say. There as 5 parts to this answer, and each part is simple. 1: Firstly, tell your sceptic friends to stop being hypocrites. Their Theory of Evolution argues that non-living brainless dust turned into living intelligent people all by itself. This is why ‘intelligent’ scientists are still trying to ‘make’ life in a test tube, since dust never makes life, or intelligence, by itself. That is a process that cannot happen. 2: If someone super-intelligent is in charge there is no problem getting a job done very quickly. Therefore, there is no problem believing that God created Adam (and Eve) on the sixth day of creation. That God Person was Jesus Christ. If you want to be the first scientist to make life you will have to copy His method, i.e. super intelligent manipulation of absolutely lifeless dumb dust. It’s a Nobel Prize winning prediction based on Genesis 1 and 2. 3: Was Adam made as an adult? The written record supplied to us in Genesis 1 and 2 is the eyewitness account of a 100% truthful person – the Creator Himself, who also gave the following instructions to the man and woman: Be fruitful, multiply and rule over the earth. (Genesis 1:28) These would have been meaningless instructions to a sexually immature child, and it is completely pointless saying them to babies. 4: The sceptics should recognise that the narrative is internally consistent on this point, based on practical observations. Adam had to be created as an adult. An infant Adam would not have survived without someone to feed and care for him. 5: Finally, as a fully mature adult Adam was morally responsible to his Creator, who gave him instructions on how to live, and the rules for living in the garden God had provided as his home. (Genesis 1:28-29, 2:15-16) For the same reason you and I are morally accountable to the original Maker and Owner of all creation – the Lord Jesus Christ. This is the real issue the sceptics are trying to avoid. We are all descended from Adam, so our advice to all: draw near to Jesus Christ as Saviour and Lord to find out what real eternal life is all about. ADAM & EVE: Who were Adam and Eve? Answer here. HUMAN EVOLUTION? Does it create any problems for Christians who believe it? Answer here. EVE: If Eve was made from Adam’s rib, shouldn’t she be a clone of Adam with a Y Chromosome? Answer here. Monkeys Don’t Cry. John Mackay looks at some significant differences between monkeys, apes and people. Available as DVD or MP4 Download. Origin of the Races and Real Roots. Find out the real history of the human race. DVD or MP4 Download. Amazing Design of Life. Ed Neeland, a professor of synthetic chemistry, explains how life can only come about by creative design. DVD only. 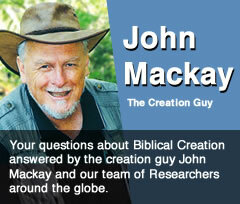 John Mackay is International Director of Creation Research. His background is in geology and teaching. He has an extensive teaching ministry on creation/evolution issues and continues to carry out research on evidence for creation and Noah’s flood. He debated many academics and theologians on the creation/evolution issue, including Richard Dawkins and John Polkinghorne. Much of John’s teaching and research is available on the extensive range of DVD’s and CDs available from Creation Research.